Shades Club is the eyewear brand we always wanted for our generation, and we’re building it with high-quality shades at affordable prices, giving our members more time and money to do what they love. Shades Club, the world’s first subscription box for sunglasses, today launched the Kickstarter for its much anticipated follow-up service Shades Club 2.0. The company’s reboot promises new and existing customers the same great monthly service with a slew of upgrades, including exclusive new styles, sleek complimentary accessories and new delivery options for travel enthusiasts who are constantly on the go. All Shades Club 2.0 sunglasses are 100 percent polarized and feature UV400 anti-reflective lenses. Each pair is FDA approved, optical-grade quality and designed by an industry-renown, in-house design team. They also pass through a proprietary fit system before every shipment and are backed by a lifetime guarantee. A concierge service that can redirect delivery of any new pair to meet you at your next travel destination. An exclusive carrying case (with a minimum three-month subscription) that can fold completely flat to the size of a smartphone when it’s not in use. The case has a slot for a credit card or ID and a small mirror for checking your style on the fly. A foldable travel organizer (with a minimum six-month subscription) that securely carries up to 5 pairs and compacts neatly into a carry-on bag. A premium storage tray (with a minimum 12-month subscription) that sorts and organizes up to 12 pairs of shades for a clean and beautiful display of your collection. Every member gets an exclusive Members Welcome Box, featuring premium shades, lens mist spray, a custom cleaning cloth and a premium luggage tag. Following Shades Club’s historic launch in 2016, the company has delivered more than 50,000 pairs of shades to customers in 65 countries. 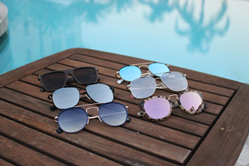 Shades Club curates and delivers an entire collection to keep its fans on trend, looking their best and with styles for every mood, outfit, and occasion - from aviators, to floatables, to foldables, to eco-friendly shades and more. Shades Club 2.0 is currently available starting at $41/month for a 12-month subscription, delivering members an entire collection of high-end shades for the same price as one designer pair at retail. For more information or to pre-order, visit pr.go2.fund/shades. Shades Club began three years ago on a quest to create high-quality, well-priced shades for friends. Inspired by a love of travel, word quickly spread and the quality sunglasses soon became a staple for far-flung destinations around the world. To date, Shades Club has delivered more than 50,000 pairs of sunglasses to friends and fans in more than 65 countries. For more information, visit http://www.shadesclub.com.